Und dann hatte ich noch dieses HG-Papier...das ist niedlich, da sind Schafe drauf auf ner Weide. Aber was macht man damit???? And then I also had this background paper...very cute indeed. Sheeps on the range. But...what can I do with this paper??? Lovely card - well done. 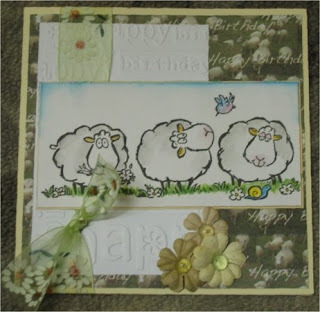 fab card Heidi, oh love this cute image and gorgeous ribbon - great work.